A large hall with a ribbed and coffered vault houses the sacristy, with a moulded cornice dividing the walls and the ceiling. A window used as a spyhole would allow the treasurer of the Cathedral to keep a watchful eye on the Cathedral’s treasure which was kept in this room. Seventeenth century cabinet-making in Malta culminates at the large decorative cupboards which cover all four walls and were stained in a way that assimilates to the natural look of the timber. Above these cabinets, one finds the alternating of the episcopal arms of Bishop Baldassare Cagliares and a depiction of St. Paul. 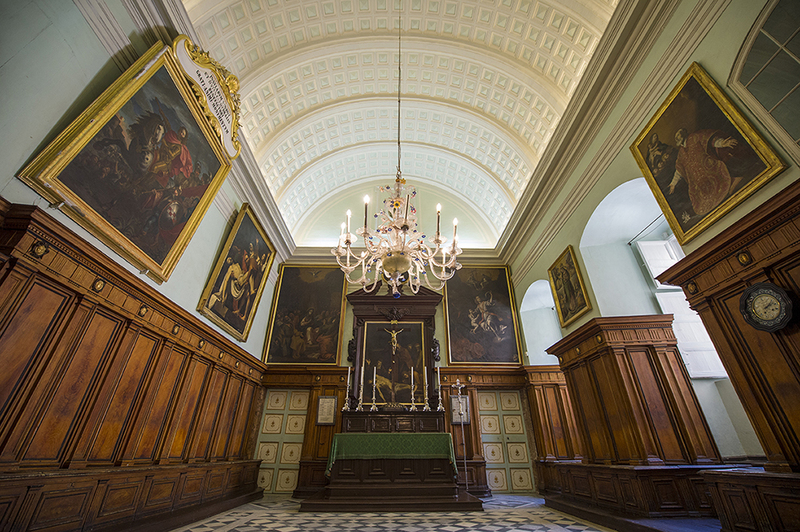 At the centre of the hall is an altarpiece adorned with an intricately decorated wooden sculpture. The arms of Bishop Cagliares are found again surrounding the painting depicting the Deposition from the Cross and Our Lady of Sorrows, painted by Bartolomeo Garagona in 1627. The work of the bottega of Mattia Preti is also found in the sacristy through two canvases, depicting Pentecost and The Guardian Angel respectively. Though these paintings were originally found in the church, they were later relocated into the sacristy when they were replaced by altarpieces from the hands of Francesco Grandi and Pietro Gagliardi. More paintings can be found adorning the walls of the sacristy, these include; The Victorious Count Roger granting Freedom to the Christian Slaves by Alessio Erardi (c.1671-1727), a copy of Caravaggio’s Deposition from the Cross, yet another of Preti’s bottega’s works depicting Santa Caterina, as well as a painting of the Assumption of Our Lady from the hands of an unknown Maltese artist.